“Do you wanna know what my research is all about? Look at this!”. This message I received last year from a good friend, who is also doing a PhD. 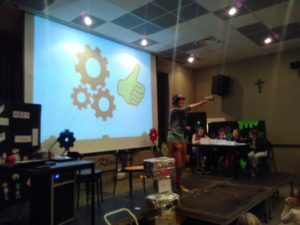 With the message came a movie, where she explained her research in a sort of competition, “the Wetenschapsbattle”, to children between the age of 7 and 12. The children organize the event, ask questions and vote for their favorites. “Quite a nice concept”, I thought, but my life went on and I ducked back into my Excel models. This year in autumn, I received a mail from university, containing advertisement for that same event. I remember looking at the mail and thinking: “How would I ever explain dynamic Excel models to optimize microalgae biorefinery design towards optimal profits and minimized environmental impacts to children? I already have difficulties explaining it to my own friends and family. If you ask them what my research is about, the most probable answer will be: “Algae” or “Sustainability” or “Environment”, or so I hope. In reality, I fear the answer will be “I don’t know” or something completely different”. Quite a challenge, so I let it rest for a few weeks. But every time I drove to Vito, I kept on trying to frame in my head how I would present it if I would enroll in the Battle. Maybe use a dog as a professor… or design a supercomputer to analyze algae… maybe make a giant alga… So on the morning of the deadline to enroll, I texted my friend, the PhD student from KU Leuven: “Would you recommend participating in the Wetenschapsbattle?”. The answer came quite fast: “Don’t hesitate, just do it!”. So I went to my supervisor, who looked at me with a critical expression, interpreted by me as: “You first complain you don’t have enough time to finish your PhD and now you’re going to do what? Presenting for children?”. But her reply was: “If you get energy from that, you can do it.” So there I was, a few hours before the deadline. Of course, I suddenly discovered I had to write several paragraphs about my presentation to convince the children. Getting selected to participate was apparently already a challenge! Would I use the easy route and just take the “algae will save the world” tour? Or would I really take the challenge and present the methodology I’m actually focusing on? In the end I chose something in between. And then the day of the Wetenschapsbattle itself arrived. The night before I had spent quite some time putting algae powder in laboratory flasks and sorting out the blue M&M’s from their different-colored colleagues. Did you know blue M&M’s can be made of algae? Natural blue pigment is a very rare thing, but luckily, some algae do contain it. 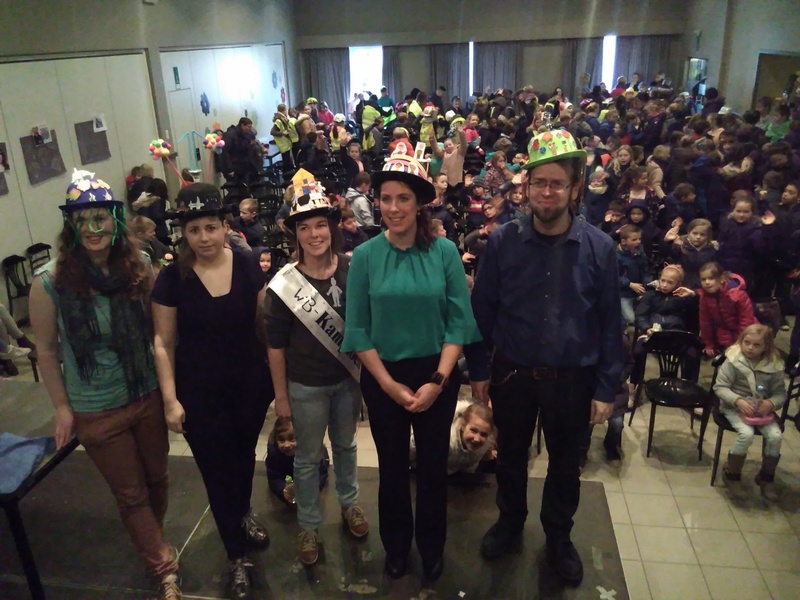 In the morning I drove to Lommel with all my preparations to arrive at a room full of children. I got a personal reporter who asked me, actually very good, questions about my research. And then I could see my competitors perform. I was the last one, so plenty of time to rebuild my stress levels. When all the others had succeeded in engaging the children for their research, my time had finally arrived: I welcomed the children in the big inventor’s bureau, where we would analyze all this crazy inventions: can we make a castle out of chocolate? Or out of gold bars? Or maybe decorate it with plastic bags? My audience clearly saw that these ideas either didn’t work, were too expensive or were bad for the environment. But… maybe we could make a castle full with solar cells? The inventor’s bureau had a winner. And the Wetenschapsbattle as well. Unfortunately it wasn’t me, but Nena who explained her research on cancer in a very clear way. Nicely done and good luck in those finals! For my part, I have been eating M&M’s for days. For weeks would have been a better idea, giving that it were five big packages. That would also have saved me from some stomach ache, but well. It works! With a huge thanks to Toon and Hans from “the Floor is Yours” and the Boudewijnschool in Lommel for the organization and the pictures. And of course to my supervisors Miet and Steven and Thomas and Julie for the ideas, feedback and support. Interested in the Wetenschapsbattle? Go to http://www.wetenschapsbattle.be/!